Although it's very nice weatherwise now I know that in a couple of months it will be cold and not very inviting in my shop. I do have a radiant heater in part of it but it's on the same circuit as my lathe and small mill so it's a bit of a "chinese firedrill" to use it very much. I have a recently purchased a taig lathe set up for wood and metal. It was purchased so that I could turn pens and smaller metal projects. I had/have the hope that I can figure a way to use it in the finished basement without speading metal and wood shavings all over the carpet. If anyone has any ideas or thoughts about how to do this I'd really appreciate some ideas. Currently the lathe and motor are on a plywood, portable base and I have an older desk that I'd likely use as a stand. Noise isn't a big concern as I doubt most things would create much and I can always schedule such work to not interfere with SWHBO. I was using my Taig lathe in a condo. And prior to that a Unimat set up with CNC. In my new basement workshop I will still want to use some sort of containment. General lathe work is fine, fly cutting is another story altogether. Chips everywhere, shielding or not. Lots of fond memories of AES. I wrote the sw for CLink interface on the NCR Tower. Also provided some training in Zurich and Shepperton-on-Thames in 1986 at the end of the original AES company (they shrank and moved back to Montreal). Still close friends with one of the hw designers. I'm sure you will have many idea/suggestions for swarf containment at the lathe. But I'd also suggest in addition a true heavy cotton duck (or better) painter's cloth on the rug. After all it protects from paint. But plastic tarps are to be avoided at all costs. They are designed to keep paint from drying, and put it all back on your shoes when you walk, unlike cloth. Likewise oil and swarf. Cloth is heavy and stays put. Plastic tarps love to bunch up and are slippery. A false floor (a panel of plywood) over the carpet might also serve well -- or over the cloth tarp, for good measure. A change of slip-on shoes in your work area will help keep swarf from tracking through the house, too. Thanks for the ideas. I must admit I thought about using plastic around and under the desk - vtsteam - thanks for pointing out the drawbacks of that idea. A tarp won't be hard to locate and I can always vacuum up regularly. Before I had an actual workshop I used my small lathe in a finished part of the basement. The lathe was mounted on a tool-box work-center from the hardware store. My system was to spread a painters plastic drop-cloth over the floor and then roll the lathe onto the plastic. When the project was done I brushed the lathe off and then rolled it off the sheet, and then rolled up the sheet (shoes and all) to clean up outside. It worked pretty good except oil on the sheet can make for slippery footing. John, here is a system that I built for my little Sherline CNC mill. I have since moved it to a larger CNC router ( almost all work is in wood now ). What you don't see is the vacuum. I bought a shop vac at Home Depot and some adapters as well. If you don't / can't make your own manifold like I did, I believe that LocLine has them available in various sizes. 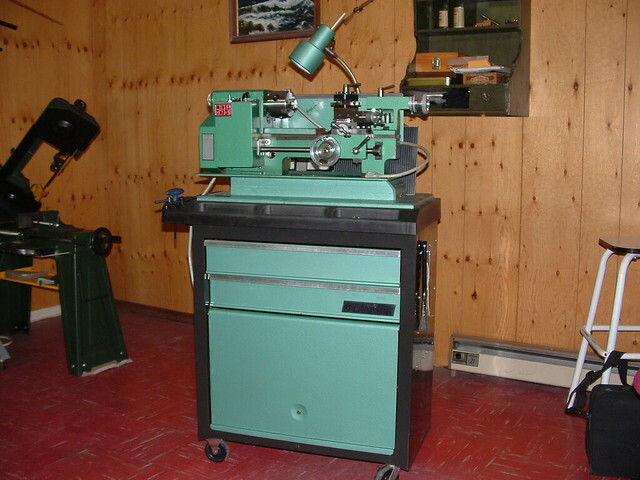 For a Taig / Sherline size lathe ( I have a Sherline lathe as well ), I would go with one of the two smaller sizes. I'm also thinking about building a similar system for my larger Myford lathe for when I cut messy stuff like wood and graphite. I use the largest Locline on my drill press. On the CNC router, it capture 95% or more of the sawdust and the shop is amazingly clean considering all the sawdust that's created.